No Raya would be complete without the annual family portraits that fire up the household, before the open house marathons, feasting and food coma take place. This year, a display of dazzling Raya Instagrams summed up the joyous mood, as high profile families broke out in their finest baju Raya, replete with the radiant of smiles. Purple, pink and red hues were favourites, sported by Dato’ Setia Aubry Rahim Mennesson and Tengku Zatashah Idris, Siti Saleha and Ahmad Lutfi, the Nasimuddins, and Dato’ Jovian Mandagie and family. Dressed in the sweetest of blue were expectant mummies Datin Vivy Yusof and Zaida Ibrahim, the latter announcing her pregnancy in a cheeky lemang overdose post. We also learned how to angle attractive family portraits from Datin Sabrena Dani, Putri Azalea Ashram Ramli and Che Puan Sarimah Ibrahim – Use the stairs! Tunku Elana Khyra recounted the celebrations with a message on gratitude, together with the most important man in her life, her dad Dato’ Yaacob Khyra. Purple couldn't be a more fitting theme for our favourite royal couple, Dato’ Setia Aubry Rahim Mennesson and Tengku Zatashah Idris. What Is Your Fondest Raya Memory? Angela Karto, beloved wife of Erwin Azizi shared this tender moment of the couple's first salam of Raya 2018. Let’s take a moment to admire Kavita Sidhu and Roberto Guiati, going strong and looking fine on day 2 of Raya visits. Green and white were the orders of the day for the striking Datuk Md Wira Dani Daim and Datin Sabrena Dani, flanking their daughter whose gesture sums up all our feelings. It was purple reign for Siti Saleha and her husband. Same same but different, Tunku Khadijah Tunku Abdul Rahman and family dressed in a rainbow of colours that evoke the vibrance of Raya. Once again, the Nasimuddins win in the best dressed department, as well as snag the prize for coordinating every child for the camera. Who knew purple and yellow could work so well – Dr Jezamine Lim and family looking so coordinated in uncoordinated unison. Nope, that’s not a food baby Zaida Ibrahim is proudly cradling – it’s the big reveal of her 19-week pregnancy. Congratulations! Pictures tell a thousand words – in the case of Sazzy Falak’s, her family sure knows how to have a good time! The ever-fashionable Datin Shirieene Hajamaideen perfected a print-clashing ensemble to perfection in this mandatory couple photo with husband Datuk Ruben Gnanalingam. The Ibrahims may have their own clusters of family themed outfits, but when combined, their bond is palpable. Cutest family award goes to Nina Sabri Ismail, Jovian Mandagie and Jeanelle Nika Mandagie, in their couture pink harmony. No love is greater than a mother’s, especially this season of thankfulness, as displayed in this embrace between Datin Esmila Safri and her daughter. Datin Vivy Yusof conveys Raya greetings from 4.5 of the family, radiating a pregnancy glow dressed in Khoon Hooi. Large gathering? Small problem. Che Puan Sarimah Ibrahim and the family of her husband Tunku Jamie Nadzimuddin show us how it’s done with just a flight of stairs. Putri Azalea Ashram Ramli and the women of her family posing on their spiral staircase can certainly give the Kardashians a run for their money. Affectionate dad Raja Tan Sri Arshad Tun Uda and his gorgeous daughters dusted their ensembles with a soothing shade of powder blue. 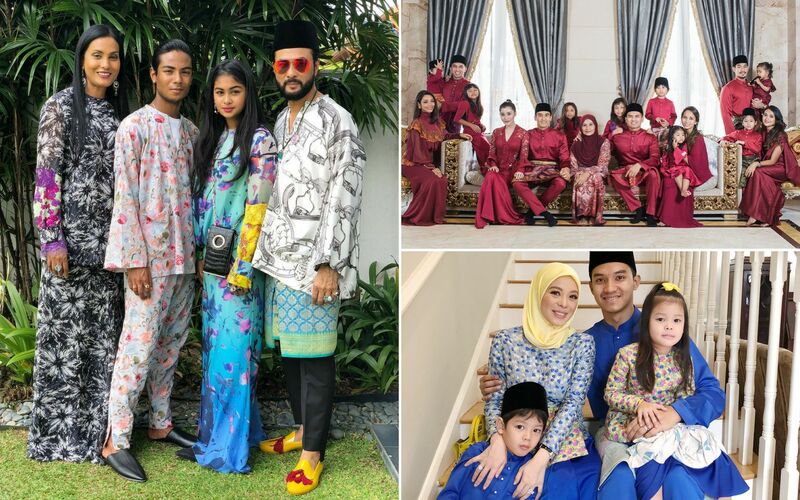 Fashion maestro Dato’ Sri Bernard Chandran and family do the polar opposite of colour coordination – the future of Raya is in a harmony of bold, individual motifs. You can’t do any wrong with the symbolic colour of Raya, which Dzameer Dzulkifli and clan opted for in their favourite shades of green. Dato' Jovian Mandagie 11 years after debuting a fashion designer, the savvy businessman is pursuing bigger expansion plans for his company—including new ventures outside of retail.